Look What We Have for You!!! KIWA HAS BEEN ADOPTED! 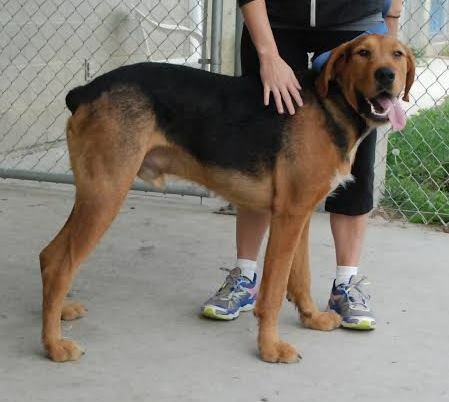 OUR THANKS TO ALL WHO CONSIDERED OFFERING THIS NICE BOY A NEW HOME!! Hi there! My name is Kiwa and I am an Airedale! Are you looking for a purebred Airedale Terrier but don’t have the time or inclination to spend hours grooming your new friend? Here is the perfect solution! Two-year old Kiwa is a short-coated Redline Airedale. His fur will never grow long and untidy and he will be happy to be brushed from time to time and offered the occasional bath! 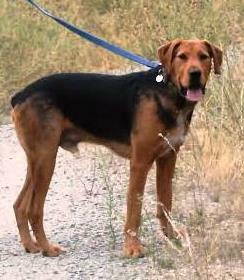 Nevertheless, this young boy is all Airedale — he’s smart and trainable, affectionate, playful, energetic and loving. He’s everything you would like and hope for from an Airedale Terrier. 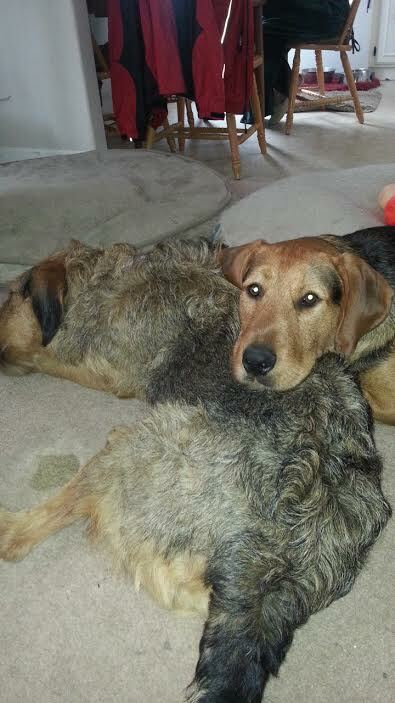 He is that rare creature: a Redline Airedale Terrier! From Wikipedia: There are also the short coated “Redline” type Airedales, they appear to be genetic throwbacks in looks to the Airedale’s early days when the breed’s coats were much shorter than today’s Airedale. Even with their shorter coat they still have the same hard wiry outer coat with a soft under coat and fall well within the criteria of the breed standard and therefore can be AKC registered and most are registered. Here I am! It’s me — Kiwa! Aren’t I a handsome fellow? Kiwa is a big, beautiful boy who was born Jan. 29, 2014.. His owner surrendered him to the SPCA around the beginning of May 2015. He was thought by SPCA staff to be an Airedale mix because he has a short coat and longer ears than the standard Airedale. Inexplicably, his tail had also been completely docked. AireCanada determined him to be a Redline Airedale — very rare and much sought-after by Airedale aficionados! Could I come live with you? I promise to love you forever and ever! I met him in June when the SPCA called to ask for help placing him in an appropriate home. I first saw him striding back from a walk with a handler and was instantly struck by his beauty. Within minutes of meeting him I knew he was all Airedale and absolutely fell in love with him as did my husband. We sincerely wished we were in a position to add him to our family – he was that special. Placing an Airedale in a new home requires considerable knowledge of the Airedale breed. Recognizing this, the SPCA offered AireCanada’s contact information to Kiwa’s new owners in the event the placement did not work out. Six months after Kiwa’s placement, AireCanada has been contacted to help find a new home for Kiwa. Kiwa is presently living in very confined circumstances with a cat, an Airedale mix and a yard about 14 by 18 ft with a low fence. Both of his new owners work and they are having problems managing an Airedale pup. To their credit, his behavior and manners have improved since he joined their family, but they simply cannot give him the exercise he needs and are heartbroken at having to give him up. 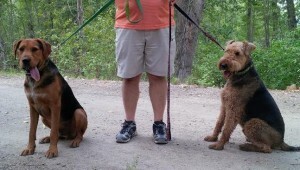 Kiwa on the left is only slightly larger than the standard-sized male Airedale shown on the right for comparison. Kiwa spends four hours a day three times a week at a daycare and plays very well with both large and small dogs. He will retaliate if two or more dogs gang up on him. The Kennel staff tell me he is a great dog who needs more exercise than his owners can give him. At home, he gets along well with the other dog (as you can see from the photo below) and seems to be fine with the cat. Kiwa is a strong youngster and does pull on the leash (like many Airedales!). This is a training issue and such behavior can be extinguished. He is not aggressive and, of course, he likes to dig and chase mice. 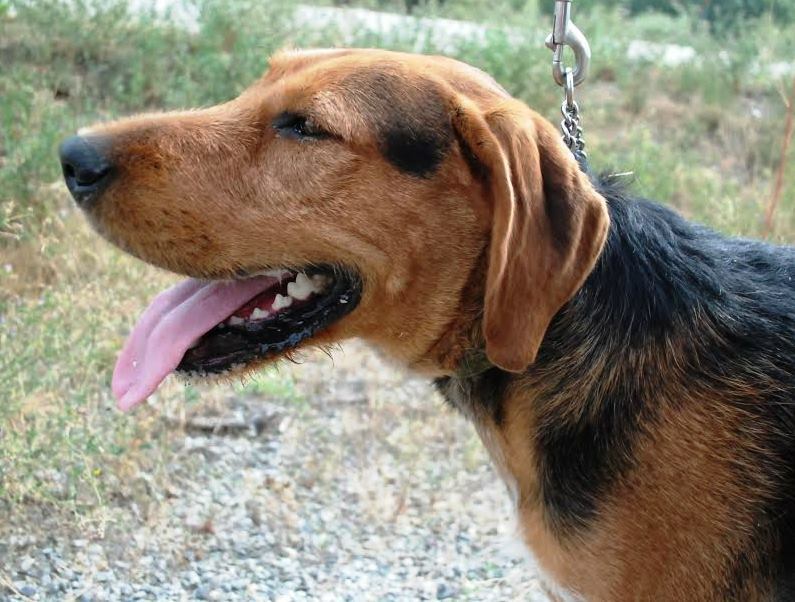 He is a large puppy (88 pounds or 39.9 kg and 27″ to the top of his back) who is in need of exercise, some training and most of all love with positive direction and a forever home. Fair warning: those soft pleading eyes will capture your heart in a second! Doc is doing great. He is a boy who loves life to the fullest and brings a great joy to everyone who knows him. He is the first Airedale we have had that is so tolerant of dressing up. We put felt antlers on him at Christmas and he was so proud of himself. He left them on when he went to deliver his Christmas presents and was so pleased with the extra attention that they gave him (we all told him how cute he was). He even sat still for a Christmas picture. He loves to play in the deep snow and the best is finding a really deep part (it is about2.5 feet in some places in the field) and rolling in it. Just before Christmas Doc and I went to obedience classes and he did very well. He is a smart boy and picked things up very quickly. We did that to see how he would take to a class setting as I would like to take him to agility. I think he will have fun with it, he has the energy, and the speed for it (not that we will go to any trials but it will be a fun activity for us). 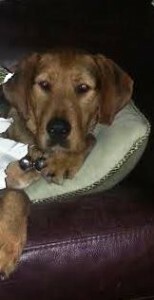 It is funny how many people really think that Doc is a mixed breed. I do a lot of educating and explaining about him. Our opinion is that Kiwa, like Doc, will do well in an Airedale-experienced home where the owners have space for him to exercise and are willing to continue his training. Like all Airedales, he requires a securely fenced yard. We believe he would make a splendid companion and would prefer an owner who is home much of the time. Do you have a home for me? I would love to be YOUR companion forever and ever! This is a rare opportunity for some fortunate individual to adopt a wonderful and unique pup. If you are interested in Kiwa, you may contact mailto:generic.puppy@gmail.com for further information. In order to adopt Kiwa, you will need to complete the application form found on this website. A home visit will be required. Kiwa is waiting for you! Will you be the lucky one to take him home?